Superior Airlines was formed by 40 ALPA pilots who were on strike against Southern Airways to compete directly against Southern. Flights began in Spring 1961 using 8-passenger de Havilland DH-104 Doves on Atlanta - Huntsville - Memphis and Memphis - Monroe, LA - New Orleans routes. 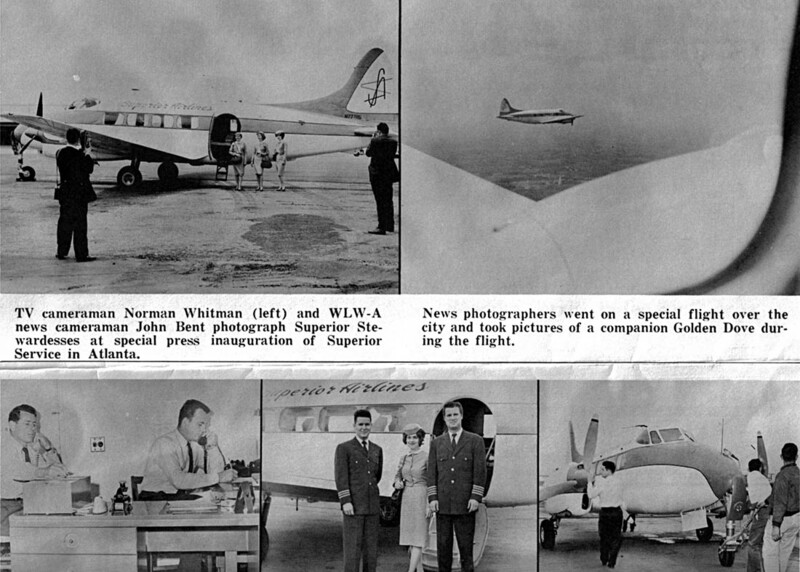 Michael Sparkman contributed these press clippings publicizing Superior Airlines preparations for opening day in Spring 1961. Superior Airlines "Golden Dove" pictured at Huntsville, Alabama. Courtesy of Michael Sparkman. Superior Airlines timetable effective October 20, 1961. The flip side of the timetable shows the actual flight schedules. The route between Atlanta and Memphis had been dropped by this time and new service had commenced at Tifton and Thomasville, GA, Ozark, AL (an alternate to Dothan, which was served by Southern), and Panama City, FL. Route map based on the October 20, 1961 timetable. Despite ambitious plans to expand into numerous Southern Airways markets, Superior Airlines was short-lived and by early 1963 the pilot group had sold its interest to Trans Air of New Orleans and to the Parker Oil Company. If you have any additional photos or information about Superior Airlines, please contact me!